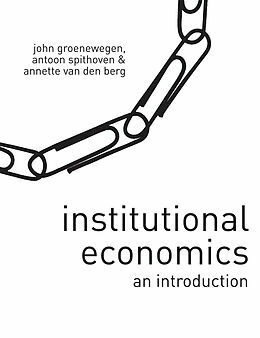 "Institutional economics is an increasingly important area in the field which also verges into political science and sociology. This concise and lucid textbook, which assumes a basic understanding of neoclassical economics, introduces the key ideas, emphasizing the "new" institutional economics but grounding readers in the traditional perspectives"--Provided by publisher. PART I: INTRODUCTION.- What is Institutional Economics about?.- PART II: THEORY.- Theoretical Framework.- Static Approaches to Institutions.- The Dynamics of Institutions.- PART III: PRIVATE GOVERNANCE STRUCTURES.- Markets.- Firms.- Cooperation Between Firms.- PART IV: PUBLIC GOVERNANCE STRUCTURES.- State Intervention to Protect the Public Interest.- Government Failures.